Journalists and media moguls have disgraced themselves in pursuit of ratings and ideological goals. Now that the Trump campaign is reaching its final implosion, let’s take stock of those journalists and media moguls who used their influence and airtime to enable this catastrophe. CNN president Jeff Zucker had no problem with misinforming his audience in the service of exploding ad revenue. Pushing Trump has also been the rule at other Murdoch properties. The New York Post is among the few newspapers in America to endorse his campaign, terming him “King Don” after his New York primary victory. (Joining the Post in this lonely endorsement was the Las Vegas Review-Journal, which—surprise, surprise—is owned by Sheldon Adelson and deployed, much as Murdoch uses the Post, as a propaganda sheet for its owner’s business interests and extremist ideology.) The Wall Street Journal generally does not endorse, but editor in chief Gerry Baker made sure his staff understood the need to be “fair” to Trump, lest their professionalism interfere with its owner’s political agenda. This attempt to further bias the paper’s Murdoch-meddled news coverage is, of course, augmented by its far-right, science-denying, supply-­side-economics-cheerleading editorial page. Per usual, Murdoch’s corporate interests and ideological obsessions reinforced each other regarding Trump’s candidacy. 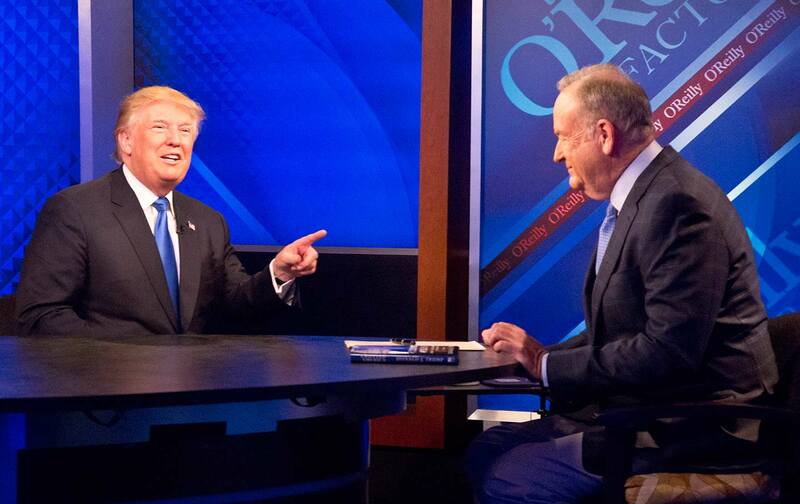 Not only did ratings reportedly dip on Fox whenever anyone was too critical, but when Trump loses, Fox will have to start worrying that a Trump-branded “alt-right” media empire will steal away its most fervently nutty viewers. Over at CNN, however, things are less complicated: Sucking up to Trump brought in viewers and hence massive amounts of advertising dollars for the network, something its president, Jeff Zucker, has known since the days when he promoted Trump’s reality shows at NBC. Zucker disgraced CNN by constantly running Trump phone calls and rallies as if the “C” stood for “Cheerleader.” He also hired Trump apologists, including former campaign manager Corey Lewandowski, who, while being paid by CNN to allegedly offer his honest opinions on the election, was simultaneously being paid by the Trump campaign to do exactly the opposite. At no point did Lewandowski do anything on the air that was inconsistent with his role as an official Trump mouthpiece—up to and including his willingness to parrot Trump’s recent complaint that the election is somehow “rigged,” a move that power-hammered the final nail in his political coffin. And yet Zucker had no problem with deliberately misinforming his audiences in the service of exploding ad revenue. It will be interesting to see how many of the above “journalists” seek to cash in postelection with Trump’s soon-to-be media empire. Kushner has already held meetings with investment bankers who presumably would put up the cash for what would likely be a white-nationalist news network, ready to embrace conspiracy theory after conspiracy theory pushed by neo-Nazis and other right-wing hate groups. As with Fox and Breitbart, a Trump-owned network would have the effect of pushing the 50-yard line of American discourse into a make-believe land where the president is illegitimate, science is a fantasy, and race and religion are dividing lines between “real Americans” and potential traitors. One thing’s for sure: There will be plenty of people willing if the price is right.